We're excited to launch our first ever Dream Lunch Kit Pin to Win Contest on Pinterest - the virtual pinboard site where you can organize and share all the images and objects you find on the web! Simply create a pinboard on Pinterest featuring your favourite Lavish & Lime waste-free lunch gear products and you'll be in with a chance of winning a $75 Lavish & Lime shop credit towards the purchase of your dream lunch kit. Pinning is easy. It's fun and if you're lucky, it might just win you a new lunch kit! *** This giveaway is now closed. Congratulations to our winner Olena R.! 1. Follow us & create a Lunch Kit Pinterest board: follow us on Pinterest and create a pinboard called 'Lavish & Lime Lunch Kit Pin to Win'. Categorize this new board as 'Products'. 2. Pin your favourite lunch gear items: Pin a minimum of 10 of your favourite eco finds from our waste-free lunch collection to your new board. (After 10, the sky's the limit!) These products can be found either in our Waste-Free Lunch category or on our Pinterest page. Each of our product pages features a 'Pin it' button, so pinning products from our site is easy. Our contest announcement image (posted above) must be included as a pin on your board. 3. Send us your Lunch Kit board: Email the url link for your Lavish & Lime Lunch Kit board to us at brendam@lavishandlime.com and you'll be entered to win a $75 Lavish & Lime shop credit! If you are not on Pinterest you can request an invitation from us by emailing us via brendam@lavishandlime.com or you can sign up directly yourself at Pinterest. If you have any questions or would like further information about this contest or Pinterest, please email us at brendam@lavishandlime.com. No purchase necessary to enter or to win this contest. All local, municipal, provincial, state and federal laws and regulations apply. Void where prohibited. The Lavish & Lime 'Dream Lunch Kit' Pin to Win Contest is open to residents of Canada (excepting Quebec) who have reached the age of majority in the province in which they reside by the start of this contest as below and to residents of the United States (excepting Puerto Rico) 18 years and older at the time of entry. The contest will start at 12:01 am PST Monday, August 20, 2012 and will end at 11:59 am PST Sunday, September 2, 2012, the contest closing date. 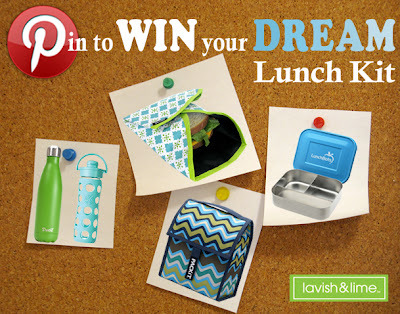 Create a 'Lavish & Lime Lunch Kit Pin it to Win' Pinterest board and pin a minimum of 10 Lavish & Lime waste-free lunch gear products to it, including the image announcement for this contest as posted above. Email the url link of this board to brendam@lavishandlime.com within the contest period to qualify for entry to win one (1) Lavish & Lime gift certificate (in the form of a coupon code) worth Seventy-Five Dollars ($75). Entrants agree upon submission of their board that Lavish & Lime shall have an unlimited license to reproduce their board, publish the url of their board and use the entrants name and likeness for promotional purposes without any further compensation. One (1) winner will be selected from all eligible entries received during the contest period. The winner will receive one (1) Seventy-Five Dollar ($75) Lavish & Lime gift certificate (coupon code) redeemable for merchandise only. Prize must be accepted as awarded and may not be transferred or exchanged. It is not redeemable for cash and is non-refundable. The winner will be selected on or about September 3, 2012 from all eligible entries received. Judging will be done by Lavish & Lime and will be based on creativity and composition of board submitted. Winner shall be notified by email on or about September 3, 2012 prior to public announcement of winner's name. If no response is received by the winner within 48 hours another winner may be chosen.